The 53 Stations may be Hiroshige’s best known work but I wasn't able to find an oversized coffee table-type book with stunning, full size prints. Any Japanese print aficionado’s personal library should have something about this great series, so I wanted to find a reasonably good photographed collection to recommend. This softcover volume is my choice. The book went through six printings from 1969 to 1979, and I can see why. All 55 color prints here (53 plus the start and end points) were photographed from the original Hoeido edition published in the early 1830s. In addition there are 17 prints from other Hiroshige Tokaido series (he produced some 20 different Tokaido series in all). If you buy, I suggest ordering a used copy in the best condition available. New copies are pricey. This volume may not take your breath away as will other Hiroshige collections reviewed here, but there are several things that appealed to me. The explanatory paragraphs adjacent to each print are excellent, the Tokaido map which indicates each station stop is very helpful, and best of all is the editor’s introductory commentary. His remarks are "old school" - sometimes personal, and stylistically very different from what you find in most introductions to books about Japanese prints. In one wistful section the editor recounts his 1927 journey on foot along the Tokaido, a distance of 300 miles. Forty years later one of his students attempted the same feat but called it quits after only three station stops. It seems there were so many cars and trucks on the road, so much "dust and smoke", that "the Tokaido is not a road to walk on anymore", as the editor quotes his student. How sad that such a vital piece of Japan’s history was overtaken by modernity. Perhaps the transformation was necessary but that wouldn’t make it less regrettable. Rather than duplicate here my discussion of the highway-like road system of which the Tokaido was a part, I refer you to this review for that information: HIROSHIGE AND EISEN: THE SIXTY-NINE STATIONS ALONG THE KISOKAIDO. Many art books are beautiful to look at, as is this one. But few also engage your sense of touch, or provide special bindings suited to the subject matter - as this book does (see below). Bestow it on an art lover and it will not be returned for credit. 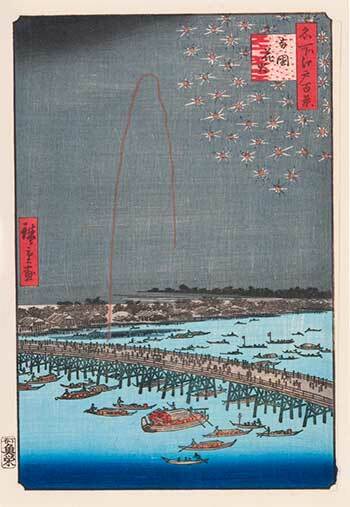 Ando Hiroshige’s 100 Famous Views of Edo, first edition, was published in 1859. There would be many subsequent editions. (The series actually contains 119 prints, but the "100" number was better suited for marketing purposes. Don’t want to get into those weeds here.) The collection was an immediate best seller, and today ranks with the artist’s 53 Stations of the Tokaido as his most familiar work. As with most Japanese prints of the era the idea for this series originated with the publisher, not the artist. But in the end Hiroshige delivered a masterpiece. Views sweep across the landscapes, waterscapes and cityscapes of Edo - from an eagle’s view high above frozen tundra to spectacular fireworks over the famed Ryogoku bridge, to merchant quarters dominated by a looming view of Mount Fuji. There are many scenes which depict nature in all its glory. While some prints are superior to others in terms of artistic merit or compelling subject matter, nevertheless Hiroshige’s brilliant, inventive mind permeates the series as a whole. The thing about Edo era prints is that early editions are almost always superior to later ones. Once print best sellers proved their marketplace mettle, publishers were prone to cut corners. Maybe save time and money not being so fussy about colors specified by the artist, or worked out by the original printer. Maybe don’t worry about repairing broken or worn out lines in blocks that should have been retired or patched up much earlier. Hey, by the 10th edition who’s to know? That’s hardly an issue here. As one measure of the care with which this book was designed the authors elected to photograph a complete first edition - from the Ota Memorial Museum of Art in Tokyo. Colors are exceptionally rich, well saturated into the handmade paper’s plant fibers. The complete package consists of an inner volume encased in a removable hard cover, on which is imprinted Hiroshige’s splendid "Plum Orchard in Kamada". For a wonderful, tactile sensation run your fingers lightly over the inner volume’s soft, silky cover. I also mentioned binding. In keeping with tradition the inner volume is stitched with thin silky cord. And the hard cover - really more of a casing than a cover - is secured by two traditional toggles. You or your giftee can spend many pleasurable hours with Hiroshige’s magnificent achievement (as did the likes of Whistler and van Gogh). Many observations in our review of Hiroshige’s 100 Famous Views of Edo apply equally to this book. Here again Taschen has published a lavish collection of a grand Hiroshige series, with photographs of first or early edition prints. In fact the Introduction makes this assertion: "The impressions …are from a private collection which is without doubt the finest set in the world, composed almost entirely of exceptional impressions from the earliest and/or finest editions of each design." Reason enough to add this volume to the personal library of any Japanese print devotee. Speaking of the Introduction, it’s a worthwhile read for anyone who enjoys knowing how a work of art came to be created. Each of these Taschen Hiroshige editions is a joy to look at, and perfect for the coffee table or as a gift which will dazzle an art lover. Not to mention their revealing look at Japanese life before the country’s later 19th century Westernization. Both come in an outer hard shell with toggle closures, which protects a soft, inner volume bound with traditional thread or cord. While the 100 Famous Views volume is vertical in keeping with the prints within, this one is horizontal, to match prints in its series. At 18" in length however, the Kisokaido volume will not conveniently fit most bookshelves, except lying prone. But so much for practical considerations. Let’s talk about the Kisokaido road, also known as the Nakasendo. The Kisokaido, like the better known Tokaido, was a strategic road which linked the military capital of Edo (now Tokyo) with the imperial capital of Kyoto. 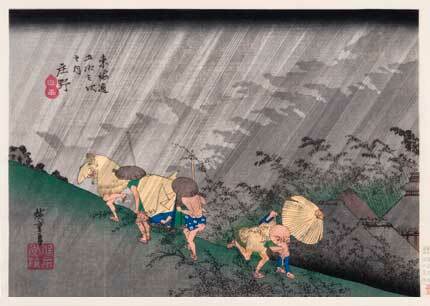 While the Tokaido followed the eastern shore before turning inland, the Kisokaido was strictly an overland route. There were three other such roads - five in total - all of which helped the shogun keep Japan’s many domains in check. Revolts were rare but quickly suppressed, in no small part because these roads facilitated deployment of the shogun’s forces over Japan’s difficult terrain. The roads served other purposes as well. In an age devoid of modern communications the government depended on couriers to deliver instructions quickly throughout the domains. And then there was alternate year attendance, designed to insure loyalty by requiring domain lords (daimyos) to make bi-annual visits to Edo. There they would live in high style on land granted them by the shogun. A contented daimyo had better things to do than rebel. But just to be sure, shoguns mandated that daimyos heading back to their home domains leave close family members behind. You could say these people were hostages, but more likely they loved life in the big city. These bi-annual journeys were a big deal, and scarcely possible without good roads to transport the thousands of staff, retainers (samurai), and hangers-on who accompanied their domain lord. But how would such a massive body of travelers be accommodated en route? The shogun saw to all that by doing what Ming-dynasty China did along its own major roads - he ordered "station stops" built. These were similar to rest stops along our modern turnpikes, except that they included inns for overnight accommodations. For exceptionally large groups of travelers - 20,000 wasn’t unheard of - room availability presumably was limited to important members of the daimyo’s retinue. Like Hiroshige’s 53 Stations of the Tokaido series, Kisokaido prints don’t always show the station stops themselves but often focus on striking scenery in the vicinity, along with everyday people and their doings. Both series feature an enormous variety of such scenery which can only be described as riveting. 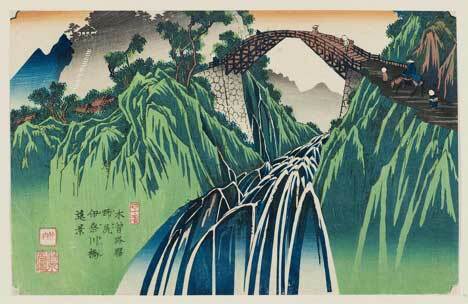 The Kisokaido prints are often listed along with other important Hiroshige series. But it’s worth knowing that initially the design job went to Keisai Eisen, a well known print designer of the period, but who was fast becoming eclipsed by Hiroshige. Eisen began work on the Kisokaido series in 1835. For reasons explained in the Introduction, part way into the work Hiroshige was commissioned to take over, completing the series in 1838. When all was said and done Eisen’s contribution was 24 prints, Hiroshige’s 47, for a total of 71 prints rather than the 69 in the series title. Numerical mismatches like this were quite common in print series, often for marketing reasons which I won’t take space to detail here. This Taschen edition is one of the most beautiful books I own with respect both to its outer appearance and to the glorious prints within.